*The Video Channel area is designed to allow South Carolina Passions members to find online videos that match their 'passions' or interests. In many cases, the video channels, and the videos themselves refer to specific brands, brand names, books, movies, television shows, company names, or people. Passions Network, Inc. would like to make it clear that all copyrights and trademarks are owned by their respective owners and/or companies. Please note that Passions Network Inc. does not host any of the videos seen on the site. They are streamed via online video distribution portals. 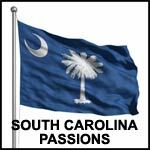 If you are the copyright owner of any video viewable on the South Carolina Passions site, and you would like it removed, just let us know.